I can’t believe Easter is right around the corner! I love seeing everyone in their Sunday best — all the littles in their suits and big, froofy dresses. 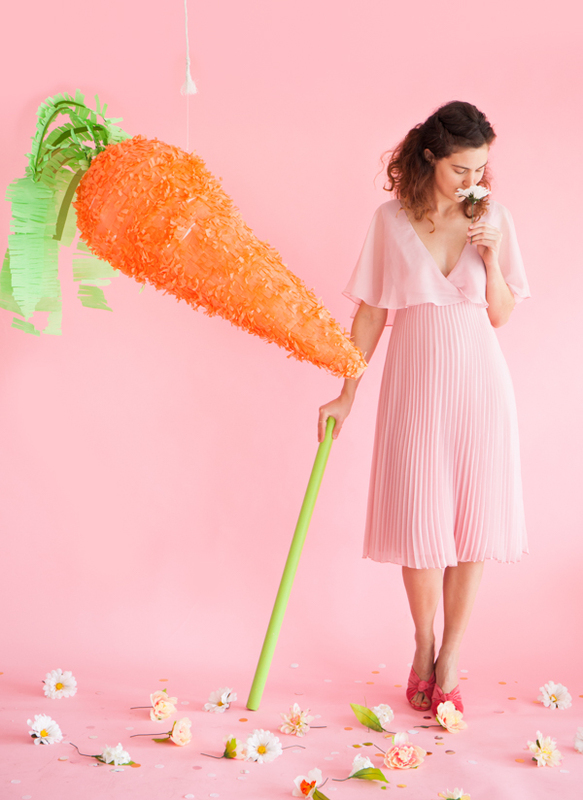 Imagine the good behavior you could get out of the kids if you dangle this carrot in front of them! 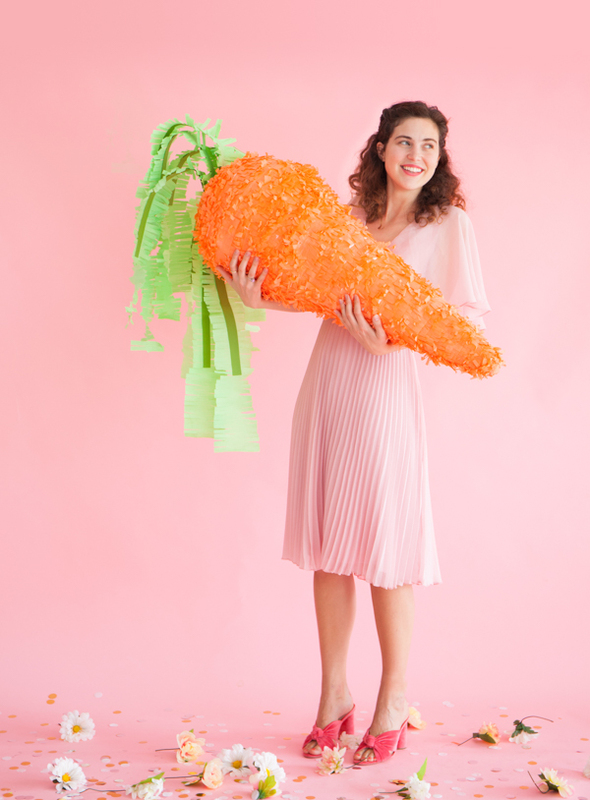 This larger than life carrot would be an awesome alternative to an egg hunt if you don’t live near a park. Read on to see how to make it. 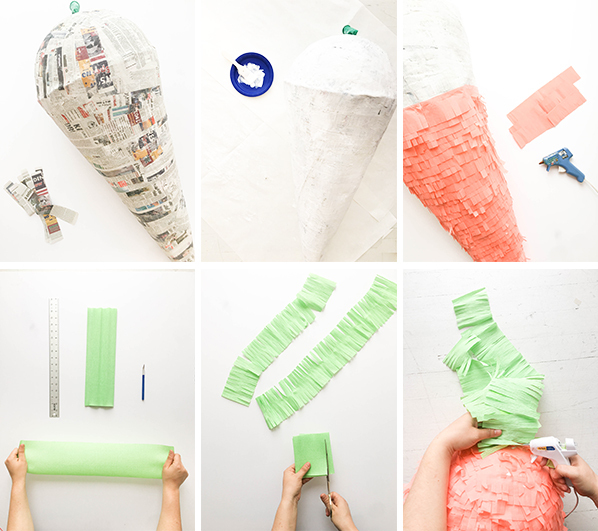 Step 1: Roll the large piece of cardstock into a cone shape. Trim the cone so the end if even. Step 2: Blow up a 3 inch balloon to fit into the top of the carrot. This will give you the round top to your pinata. You will want it to be snug. Step 3: Mix your paper mache mixture, we used equal parts flour and water. Cut your newspaper down to strips. Paper Mache an even layer to the whole pinata. Let dry completely. Repeat layers until you hear a hollow sound when you ‘knock’ on the pinata. Once dry, paint white. Step 4: Make fringe for your pinata, our fringe was about 2in tall and 2mm wide. Step 5: Using a hot glue gun, fringe your pinata from the bottom up. Step 6: To make the greens, start by cutting a piece of crepe paper 5” by 8” along the grain. Hold both ends of the paper and pull the paper until most of the stretch is gone. Step 7: Fold both ends towards each other two times. Begin cutting the paper leaving a small space in the middle. Once one side is cut, cut the other side, be sure not to cut all the way through! Step 8: Slightly twist your stems to give more dimension. Add a cardstock spine to give them a little more lift. Hot glue your stems to the top of the carrot and you’re done! This is awesome!!! And looks super easy to make! What a happy Easter piñata!! Wow! 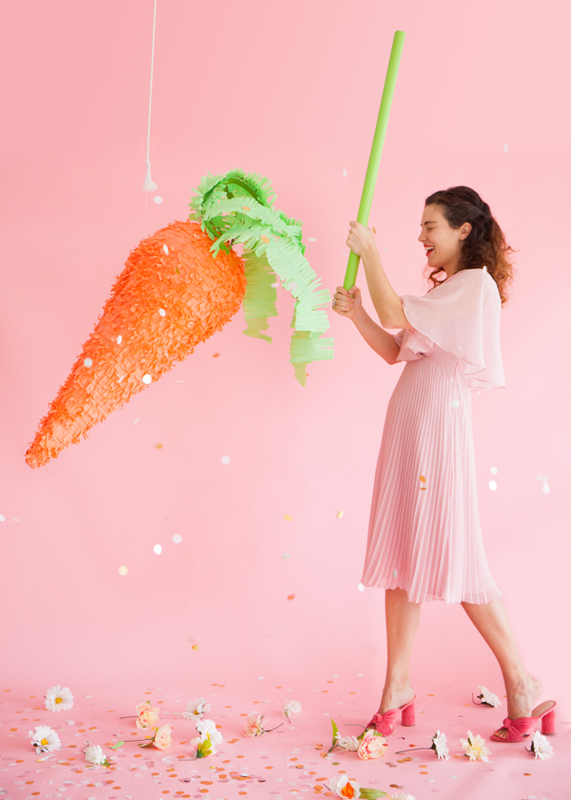 nice post .It will be more helpful for all who loves to give surprises.You have explained each steps in a detailed way .I don’t know whether it will be success or not even though I will try to make this giant carrot .Thank you for sharing .Looking forward for more post like this . Thanks for explain about each and every step. 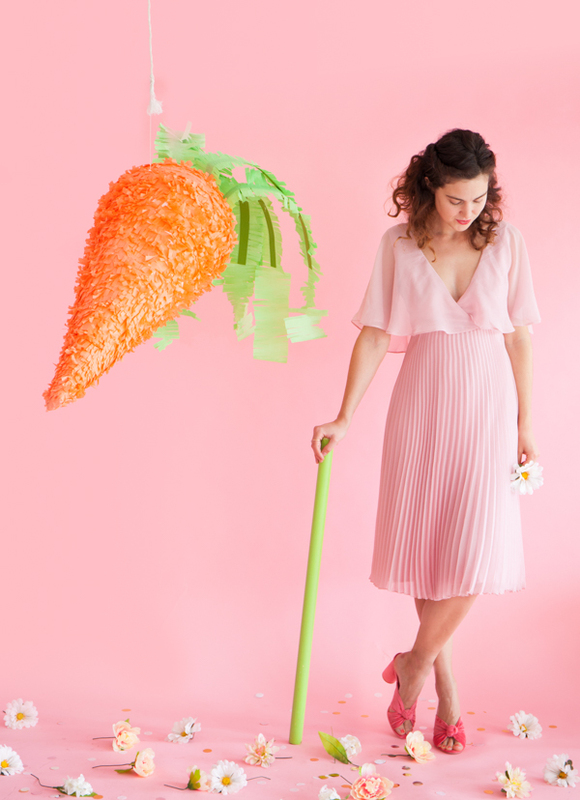 I don’t have any idea about how to make this giant carrot. 1) When would I include something to hang it with? Would I need to have that out when I’m covering it with newspaper? 2) Would I fill the pinata before covering it with paper mache? Hi Chloe! 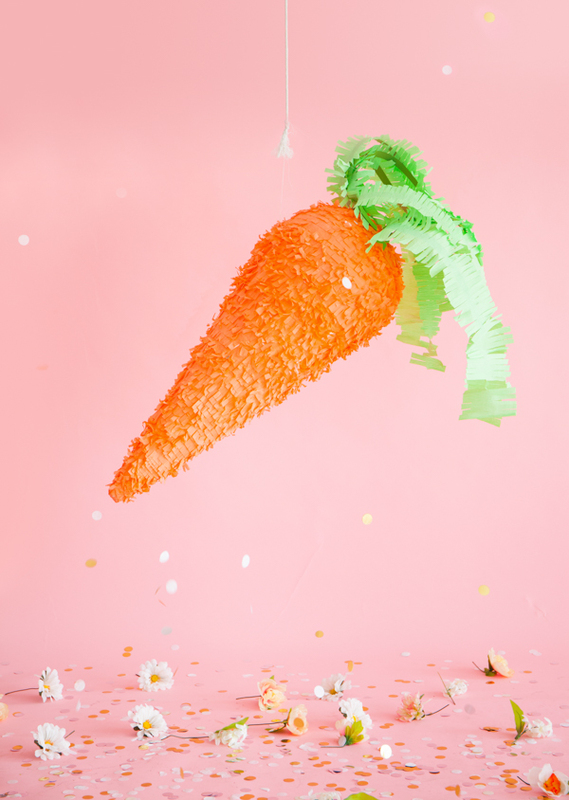 For this pinata, we tied fishing line around the carrot after fringing, just before the widest part. Rope would work just as well! Also, it looks like we totally forgot to add the trap door to the copy (thanks for catching that!). 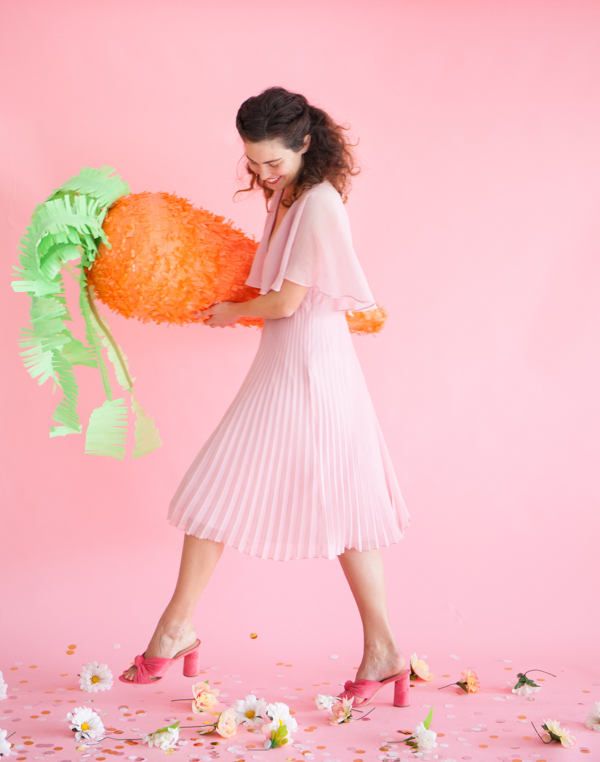 We cut three sides of a 4″ square into the side of a pinata to fill it with after fringing. Just glue it shut when you’re done! Thank you so much! I love this website- thanks for your hard work!